That pumpkin just makes me laugh - great stuff! Oh, I like this idea. Ethan's school has roughly the same policy. Granola bar most definitely does not say Happy Birthday like a cupcake does. Too bad it has had to come to this. The prototypes look cute! Would simple pumpkin spice muffins work as a treat? cute! !-i can't imagine no sugar in my classroom. i know the kids will love what you've made. maybe you could attach them on a pretzel stick or something to make them look like pumpkin puppets? They are fantastic!!! Are you allowed to say they are for Halloween? ...My kid's school...no Halloween...has to say "Happy Fall/Autumn"...yup! Hurray for being creative! I do not think that I would have ever made it through 13 years of teaching without SUGAR! They're adorable! And I love the expressions on both faces. What do the girls think of them? Bella's pre-school won't even allow treats from home (knife in heart) unless they are commercially packaged-----in NO way does a pudding cup say Happy Birthday. We are also not to send individual favors to send home. 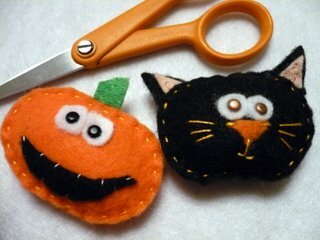 Otherwise I would want to make something as cute as your pumpkin and cat!!!! well, those little guys just make me smile! SOOOO cute!